Austria, which holds the current presidency of the EU, is trying to reach political agreement on the proposed EU Digital Services Tax (DST) before it hands over the presidency on 1 January 2019 to Romania. According to the responsible EU Commissioner for Economic and Financial Affairs, Taxation and Customs, the Frenchman Pierre Moscovici, it is doable to have an agreement by Christmas. He is not the only one. His optimism is shared by his fellow countryman the French Finance Minister Bruno Le Maire, who is one of the strong advocates of the EU DST. Le Maire can be regarded as the initiator of the current debate in Brussels as he took the initiative for a joint letter by the Ministers of Finance in France, Spain, Italy and Germany in June 2017 to the European Commission. In this letter they urged the European Commission for action at EU level. This resulted in two draft proposals issued by the European Commission on the 21th March 2018: a DST also referred to as the short term solution and the proposal for a directive on the significant digital presence, also referred to as the digital permanent establishment or long term solution. All efforts in Brussels are now focused on the DST to try and reach political agreement during the next ECOFIN meeting on 4 December 2018. Given the level of debate on the DST, the question arises how likely it is that EU member states will reach an agreement (of any substance) during this meeting. In order to answer this, we need to first look at what has been published in media interviews and official government reactions. This gives us more insight in the positions taken by the governments of the 28 EU member states. Since the launch of the DST proposal in March 2018, there have been some very clear proponents and opponents which have not changed their mind. And there are also some countries which (seem to) have changed their view in the past 8 months. For example, Germany and the UK. Clear and steady proponents are France, Italy and Spain and for the opponents this is true for Ireland, Denmark and Sweden. A number of smaller countries or economies have also issued a reasoned opinion under the so-called yellow card procedure as provided for in Protocol No. 2 of the Lisbon Treaty (Denmark, Malta and the Netherlands) or have raised other concerns such as Finland and Sweden. The map below illustrates the various positions varying from red (opponents) to green (proponents) or amber (less clear). Earlier this week during a seminar organized by the Dutch Association of Tax Advisors (the NOB) for tax directors and in-house tax managers some observations were made regarding the DST. The question was raised whether base erosion will continue in certain countries, even when aggressive planning has been put to an end as a result of the BEPS action plan and unilateral measures (such as the GILTI tax introduced in the US tax reform on 1 January 2018)? And if that is the case, whether this is a driver behind the introduction of the DST and the political support for the DST by certain countries? This is a valid question as looking at the OECD Interim Report from March 2018 (‘Tax Challenges Arising from Digitalisation’ – Interim Report 2018), there appear to be three groups of countries. The first group prefers targeted measures for tech companies (ring fenced solution), whereas the second group advocates a solution that applies to all companies. The third group believes that the actions which have been agreed under the OECD BEPS plan, are likely sufficient and consequently no special additional measures are needed for the digital economy. 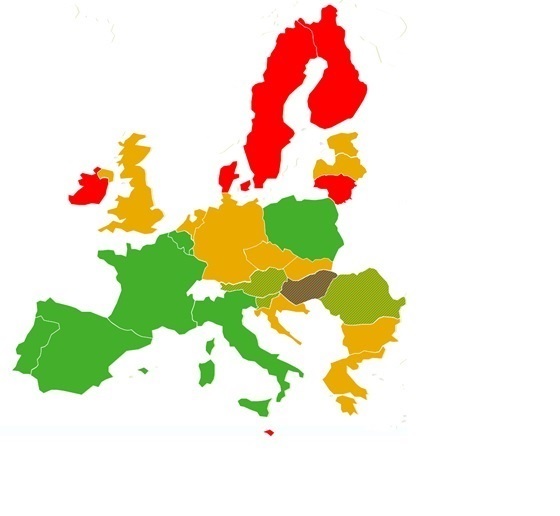 In the slides of the presentation at the NOB seminar (which can been viewed here), various statistics of economic indicators with country comparisons were shown from various sources such as from the European Commission, Eurostat, Insead, Forbes etc. A comparison was made how the proponents and opponents of the DST score on these indicators. As the NOB is a Dutch organization, the Netherlands was also included in the comparison. Although not a scientific study, the comparison provides food for thought as it indicates that the proponents of the DST have primarily bad scores whereas the opponents of the DST are very often best in class with respect to the economic indicators. Also indicators which are not necessarily economic in nature were compared such as the EF English Proficiency Index, which shows the ability to speak English in non-English speaking countries. The conclusions are the same: opponents of the DST have high rankings in the English Proficiency Index whereas the proponents are ranked much lower. So what does this tell us? Obviously everyone should draw their own conclusions, but it is fair to say that a number of countries struggle (and others don’t) with the globalization of the world economy. And if a country is in the league of the struggling countries, a consequence is that such country’s tax base will continue to erode even if aggressive tax planning has been put to a halt. If a country fails to produce successful new businesses, this will inevitably lead to a reduction of corporate profits and the tax base generated in that country. Consequently, tax revenues will go down. Such countries are forced to look for alternative sources of tax revenues, such as the DST. Another question is, whether the EU DST proposal can be named and presented in general as “Fair Taxation of the Digital Economy” when it results in double taxation, does not take into account when companies have low profit margins or even are loss making. Moreover, there are many companies which are high income tax contributors in the member state where they are headquartered. They have to pay the DST as well, without receiving a relief for double taxation. Should such EU companies be penalized for the fact that governments around the world have not been able to reach agreement yet to change the international allocation rules where profits should be taxed? Obviously one can – and likely should - argue that user participation and the value of user data requires a fundamental change in the international tax rules, resulting in a different allocation of taxing rights. This is the objective under the long term solution and needs global consensus. But is it fair to penalize companies in the meantime with a DST in case they pay their fair share under the current rules of international taxation? Therefore, as a first step, the proposed DST should be amended to make it fair and more targeted (which it is not at the moment). This can for example be achieved by providing an exemption of the DST, if it can be demonstrated that the consolidated group of companies pays a certain level of corporate income tax. Such a more targeted solution would also be aligned with the wish of German Finance Minister Olaf Scholz who favors a minimum tax for companies (see interview Der Spiegel Online 12 November 2018). However, there are likely more steps required to reach unanimous consensus on the DST, while at the same time more and more of the proponent countries introduce their own domestic versions of the DST. For that reason, other than a political agreement potentially on approach, it is unlikely that the December ECOFIN meeting will end with a clear agreement on all aspects of the DST, resulting in continued uncertainty and additional compliance/costs for companies.